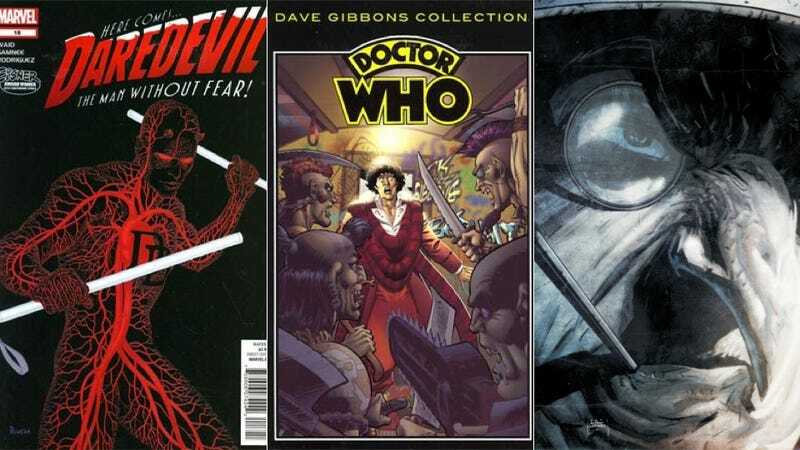 Welcome, then, to the Panel Discussion Dozen Trio, where I pick out just-released or out-soon comics that I think are worth paying attention to. Ready? Then, let's meet the sequential art that'll be draining your wallet this week. Be sure to chime in with the books you'll be picking up or that you think everybody should be ready in the comments. There's an old saying about bad people never thinking they're bad. The interpretation of Oswald Cobblepot that we get in this collection of the series by Gregg Hurwitz and Szymon Kudranski differs. Yeah, we get sympathetic flashbacks of Batman's bird-obsessed nemesis but Hurwitz also makes it clear that when the Penguin lies, cheats and kills in the present day, he knows exactly how horrific he's being. Kudranski draws a Batman who's got the imposing affect of a bully, rendering the Dark Knight in a way that channels how the Penguin must see him. Very well-done. Tom Baker played the Doctor that I used to catch on PBS when growing up. Dave Gibbons drew superhero stories that imprinted strongly on me when I was a little older. The fact that two things from my youth can come back in a new collection is enough to pique my interest. I really want to see how Gibbons tackles the occasionally busted look of the Baker-era Doctor episodes in his clean illustrating style. He's got that scarf down, though. I really hope Matt Murdock isn't crazy. But I'm dying to see where the storyline that plumbs his sanity will take us. The core tension in Mark Waid's Daredevil Run has come from the idea that a man who succumbed to the worst life had to offer could suddenly turn away from all that angst. We've been led to believe that the blind superhero is psychologically okay. I can't tell whether I want that to be true or not.